India alcoholic beverage industry is one of the biggest alcohol industry across the globe only behind from two major countries such as China and Russia. Growing demand for alcoholic beverages in India is majorly attributed to the huge young population base and growing consumption of alcohol by the young generation as well as rising disposable income is strengthening the industry growth. With population of 1.3 billion India is one of the largest consumer markets across the globe. It is also demographically one of the youngest with around 50% of its population below the age of 25 and around 65% below the age of 35. The majority of alcohol volume is consumed by people between the ages of 18 and 40.These demographic stats are expected to fuel the growth of alcoholic beverages market over the forecast period at rapid pace. Additionally, rapid urbanization of tier-II cities is further fueling the market growth. Goldstein Research analyst forecast the India alcoholic beverages market to grow at a CAGR of 7.4% during the forecast period 2016-2024. Further, the market is anticipated to reach USD 39.7 billion by the end of forecast period as alcohol consumption is growing in urban areas of the country. The report covers the present ground scenario and the future growth prospects of the India alcoholic beverages market for 2016-2024 along with the total revenue of beverage industry in every region. We calculated the market size and revenue share on the basis of revenue generated per segment and region. The revenue forecast is given on the basis of number of market players and current growth rate of the market. Based on origin type, Indian Made Foreign Liquor (IMFL) accounted for the largest market share of more than 40% in 2016. On the other hand, foreign liquor bottled in origin or imported alcohols showed the fastest growth in terms of consumption in last few years and likely to grow at faster pace with CAGR of 25% over the forecast period. India Alcoholic Beverages Market Outlook 2016-2024, has been prepared based on an in-depth market analysis from industry experts. The report covers the competitive landscape and current position of major players in the India alcoholic beverages market. The report also includes porter’s five force model, SWOT analysis, company profiling, business strategies of market players and their business models. India alcoholic beverages market report also recognizes value chain analysis to understand the cost differentiation to provide competitive advantage to the existing and new entry players. 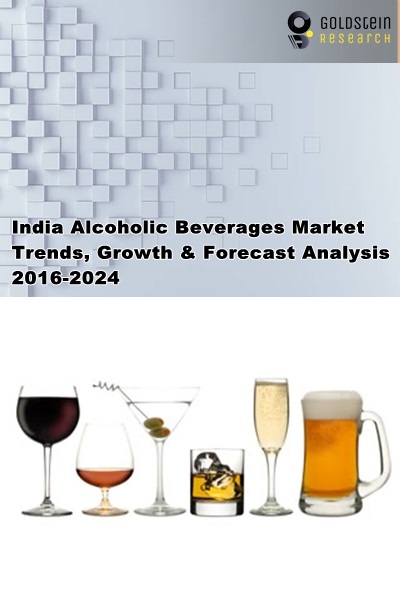 Our India Alcoholic Beverages market report comprises of the following companies as the key players in the India alcoholic beverages market: SABMiller plc, Anheuser-busch InBev, Carlsberg, United Breweries Ltd., Mohan Meakins, Radico Khaitan, United Spirits, United Breweries, Tilaknagar Inds., Som Distilleries, Globus Spirits, Heineken NV, Carlsberg breweries A/S and Beam Suntory. According to the report, major driver in India alcoholic beverages market is growing consumption of alcohol owing to rapid urbanization and favorable demographics in the country. Huge population in India are migrating towards bigger cities, where they are exposed to a wider variety of alcoholic beverage products, including IMFL and significantly contributing to the market growth. India is a young country, with more than 55 per cent of Indians falling in the 18-45 years age group. This is the age group the industry targets as potential customers. Further, the report states that one challenge in India alcohol beverage market is liquor licensing and sourcing. In terms of starting new business and expansion liquor licensing and sourcing emerged as the major growth barrier for the industry, as the necessity to obtain number of mandatory licenses and regulation related to hours of operation and consumers minimum age, which varied from state to state. Geographically, South India accounted for the largest market share of more than 45% in terms of alcohol consumption owing to significant rise in urban and female alcohol consumers in the region. North India and Western India are expected to be fastest growing markets owing to growing number of urban cities in these regions and presence of favorable demographic factors.